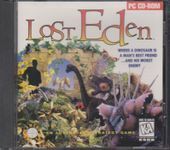 Lost Eden is an adventure game produced by Cryo Interactive and published by Virgin Interactive in March 1995 for the PC running DOS, Macintosh, 3DO and CD-i. It is set in a world where humans and dinosaurs coexist. In it, one plays the human character Adam, and is accompanied by a number of characters during the game. Although it did not receive much attention from the gaming media and public, it has been congratulated for a good standard of graphics for its time, largely using pre-rendered 3D graphics, and also for its creativeness and detail. However, it has also been criticized for being too short and simplistic. Perhaps the most distinct quality of the game was the background music created by Stéphane Picq. Source: Wikipedia, "Lost Eden", available under the CC-BY-SA License.